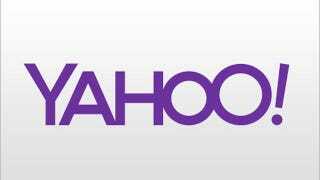 In what could possibly be the most convoluted way to put on a new pair of purple pants, Yahoo has announced that it will be changing its infamous purple exclamation point logo into... something different. You see, it's not the new simple logo above even though Yahoo posted an image of that new logo in a release talking about the new logo and used that same new logo all over its Tumblr page and is even using that new logo on Yahoo.com. No, no, no. That, I repeat, is not the new logo. That's like saying you're changing your website name but not the URL. Or naming your company something else entirely even though the rest of the old signage is staying up. Or calling your wife a new name before the divorce actually went through. It's confusing as hell! Whatever. September 5th. A month long changing of the guard. A 30 day festival filled with purple streamers and temporary Yahoo tattoos. A continuous change for change sake. A fantastic waste of time (actually, Yahoo should just keep changing its logo forever. Every day until the end of days).